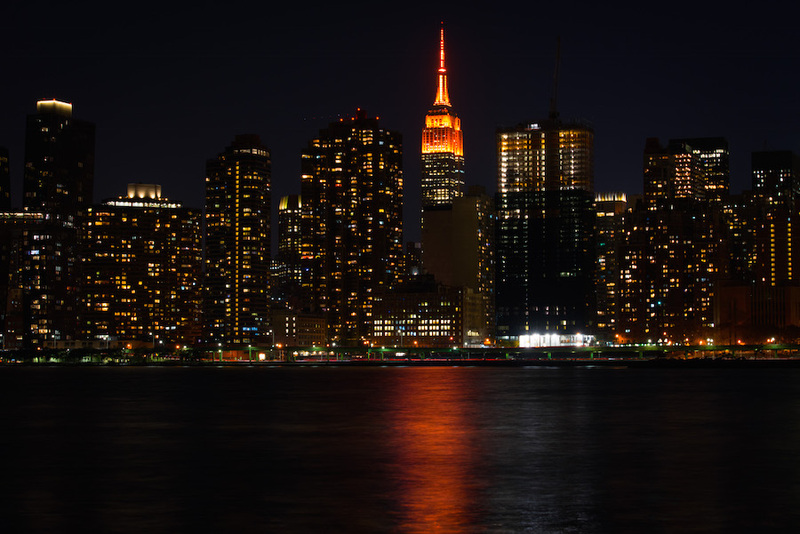 Last night, major buildings and billboards around New York City, including the Empire State Building and One World Trade, were lit in orange, the color of Amazon’s logo, in support of the city’s bid to host Amazon’s HQ2, its headquarters outside Seattle. Overall, the application submitted by the New York City Economic Development Corporation is unremarkable. It points out that Amazon can hitch on to the tech industry already in the city, and highlights the talent, the city’s infrastructure as a “proven ecosystem for innovation” and its track record of implementing grand plans. The application also underscores New York City as a bastion of higher education and a host to thriving industries beyond tech, including fashion, media, and manufacturing. What the bid did not do is provide a plan for how the company would integrate with a single neighborhood in the city. Unlike other candidate cities, it did not offer extra subsidies or tax breaks for the tech giant. Four neighborhoods are forwarded as potential sites for HQ2: Midtown West, Lower Manhattan, Brooklyn Tech Triangle, and Long Island City. 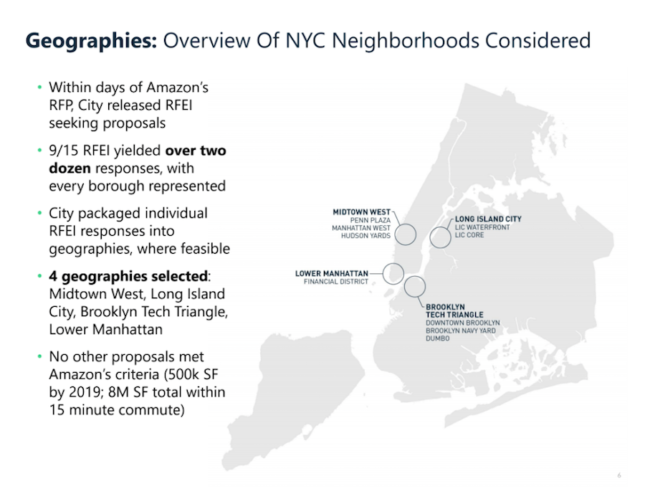 All of these neighborhoods applied for inclusion in the EDC’s application through an RFP released by the city, and were selected largely due to their access to public transit lines and housing markets ripe for expansion. New York’s application was accompanied by a letter to Jeff Bezos, the Chairman and CEO of Amazon, co-signed by more than 70 elected officials from New York. The letter focuses on the city’s role as a transportation hub for the East Coast and Mayor Bill de Blasio’s commitment to sustainability through the city’s OneNYC plan. In the EDC’s promotional video accompanying the application, a mouse scrolls through a faux Amazon page for the city, listing “product details” like 2.3 million residents with bachelor’s degrees or higher, the largest number of Fortune 500 companies of any city, and 9,000 startups. Near the end of the video, Mayor Ed Koch is even resurrected in the form of a customer review dating from 1986: “New York is the city where the future comes to rehearse.” Rehearse for what exactly, we wonder. HQ3?